Your community awaits. Call them together. Through community building that begins at the SAGE Table, we’ll tackle the problem of loneliness that affects so many in the LGBT community—especially our elders. SAGE Table is an opportunity to build intergenerational connections that can sustain us all as we age. SAGE Table can happen any day of the year. Volunteer to host a SAGE Table and we’ll send you a guide to help you plan. Join the SAGE Table Facebook Group to find new friends and learn about more intergenerational events in your community. What does a SAGE Table look like? A SAGE Table looks beautiful because it’s created with a diversity of smiling faces—older and younger—showing up to talk and share and learn from each other. A SAGE Table doesn’t have to be dinner—it can be a lunch or breakfast or even a snack. 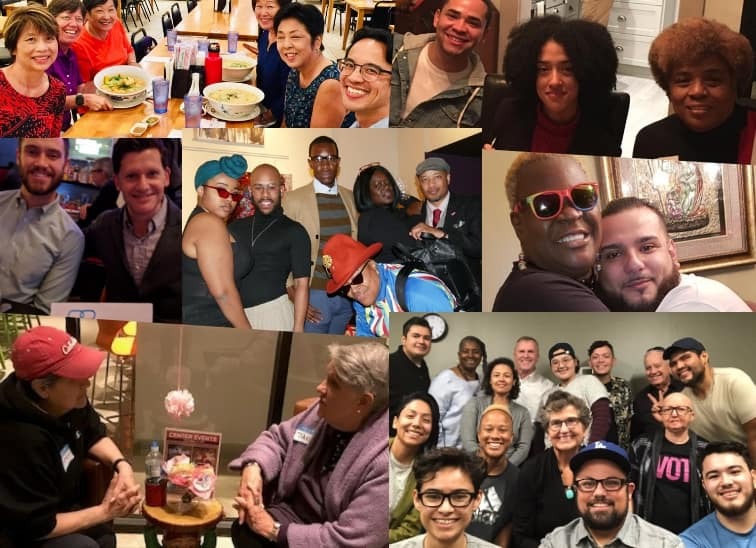 You can have a SAGE Table anywhere—at your home, the lunchroom at your office, a local restaurant, a place of worship, a picnic table in a park or any place where you can relax and facilitate conversation between younger and older LGBT people and allies. If you are hosting as either an individual or as part of an organization or business, sign up here. We will send you the SAGE Table Planning and Conversation Guide. What’s expected of me as a SAGE Table host? Fill out this form so we can send you the SAGE Table Planning and Conversation Guide. Bring together people of different ages who are part of, or allied with, the LGBT community. Provide guests with some food and facilitate conversation using the conversation guide that we’ll provide you. Because SAGE Table is a friend-raiser—not a fund-raiser—you won’t ask your guests for money. Instead, as you close your event, you will ask them to follow up by meeting again with someone from a different generation whom they met at your event, hosting their own SAGE Table, or planning to participate in other opportunities we will provide to take action and make a difference. Is SAGE Table a fund-raiser? No. The goal of SAGE Table isn’t to raise money—it’s to build connections. We’re not asking you to open your wallets for LGBT elders, we’re asking you to open your hearts. For some of us, that’s a harder thing to do, but it’s what our community needs. What do we talk about at a SAGE Table? Once you fill out this form, you’ll be able to download our conversation guide. We encourage SAGE Table hosts to moderate the event conversation (or invite someone else to do so) using the conversation prompts in the guide. SAGE Table is really about listening and learning from each other in a relaxed, fun way. Why is SAGE Table important? 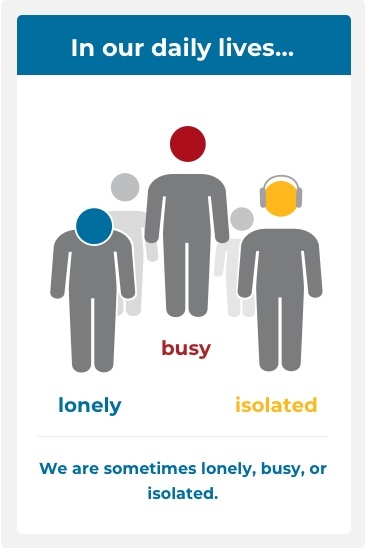 Loneliness and social isolation threaten everyone as we age—but they’re more likely to be problems for LGBT older adults. 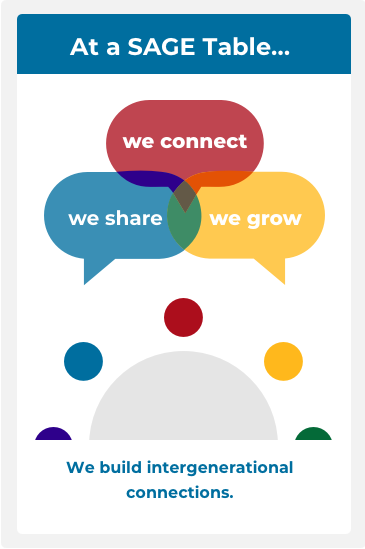 Through SAGE Table, we can reach out—person by person, community by community—to connect with one another. 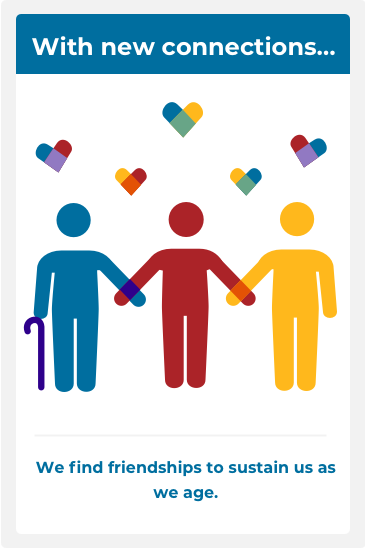 Together, we can build our own, real-life social network to support our LGBT elders. Join our SAGE Table Facebook group to make friends and learn about intergenerational events in your community. 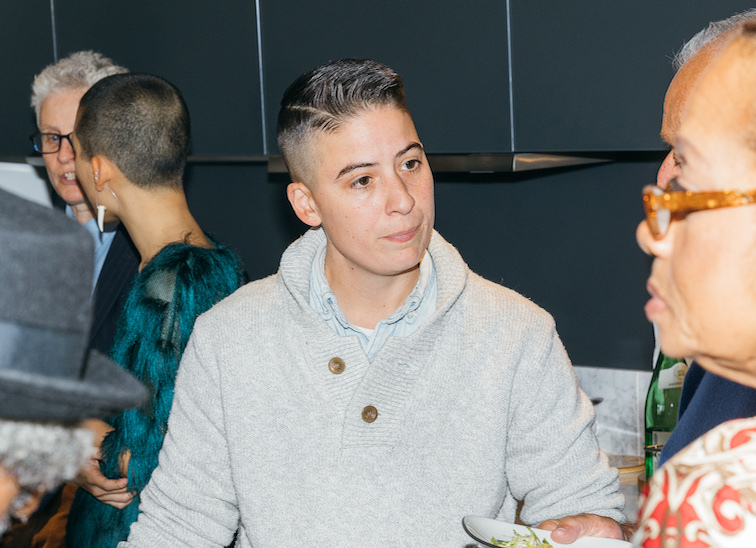 Hosting a SAGE Table affords you the opportunity to learn about LGBTQ history in a profound way: through the people who lived it. It also allows you to better understand your own role in creating our history and our future. 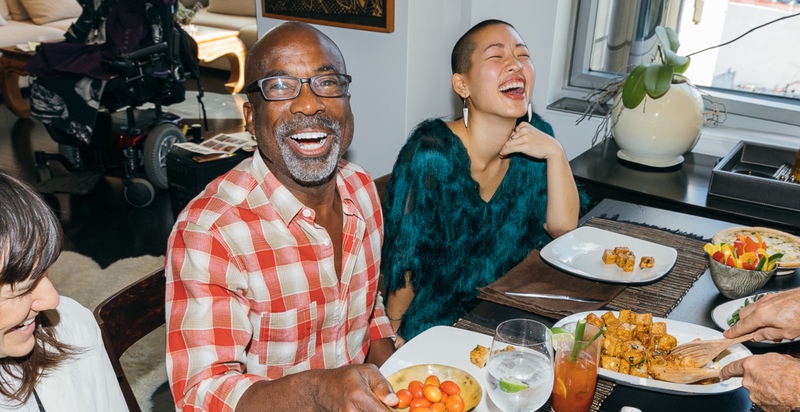 SAGE Table is about building real connections IRL (in real life) that can sustain us all as we age. Last year, half of SAGE Table events were hosted by organizations. Food, casual conversation, and a relaxed environment make for a great engagement opportunity! SAGE Table is being brought to life by the dedicated members of the SAGE Table 2018 National Host Committee.